RESULTS: Mikey Garcia beats Robert Easter Jr.
WBC 135 pound champion Mikey Garcia (39-0, 30 KOs) was forced to go the distance in defeating International Boxing Federation lightweight champion Robert Easter Jr. (21-1, 14 KOs) by a 12 round unanimous decision on Saturday night in their unification match to become a two-belt holder at the Staples Center in Los Angeles, California. Garcia knocked the 27-year-old Easter to the canvas in round three, and then did just enough in the remaining rounds to win a decision by the scores 116-111, 117-110, and 118-109. Boxing 247 had Mikey up by four rounds at the end. Garcia won, but it wasn’t the dominating performance that was expected of him. He had the same kind of performance as he did in beating Sergey Lipinets last March. Garcia knocked Lipinets down once in the fight, and won by four rounds. It was nothing special from Garcia. But at least with the Lipinets fight, Garcia had the excuse that he was stepping up a class to 140. Tonight, Mikey was back at his old weight class at lightweight and he didn’t look great apart from his knockdown of Easter in round three. Easter made it a point of sticking his long jab in the face of Mikey all night long in making him have to walk through the shot to land anything of substance. Mikey did just that, but his timing was offset enough by the jabs of Easter Jr. to keep him from dominating the fight. After Garcia knocked Easter down in round three, it was thought that he would finish him off. That didn’t happen, as Easter went back to fighting smart on the outside and dominating the fight. In the 9th round, Easter Jr. looked tired of moving, so he stood and traded with Mikey. Although got the better of the action, Easter landed some nice shots in the round. He made Mikey earn everything that he landed. After the fight, Mikey made it clear that he’s still up for a fight against IBF welterweight champion Errol Spence Jr. However, it remains to be seen whether Garcia will take the fight with him. I don’t think Mikey is ready for Spence, but that’s his choice. Mikey unfortunately doesn’t have much chice for him in terms of taking a big fight in the remainder of 2018. He’s not going to be able to face WBA lightweight champion Vasyl Lomachenko, who is promoted by Top Rank, because the promoters for that fighter is interested in matching him against their own fighter WBO lightweight champion Ray Beltran in November or December. There’s no one worthy at light welterweight for Mikey to fight. At 147, Spence and Keith Thurman are considered the belt. Thurman is still injured, so he’s not an option for Mikey. In the co-feature bout, Luis “King Kong” Ortiz (29-1, 25KO) smashed former heavyweight title challenger Razvan Cojanu by a 2nd round knockout. Ortiz landed two heavy shots in the 2nd round that knocked the 6’7” Cojanu on the canvas. Cojanu got back to his feet, but the fight was stopped on the spot. Ortiz’s quick win over Cojanu puts things in perspective in his performance compared to Joseph Parker’s 12 round decision over him last year. 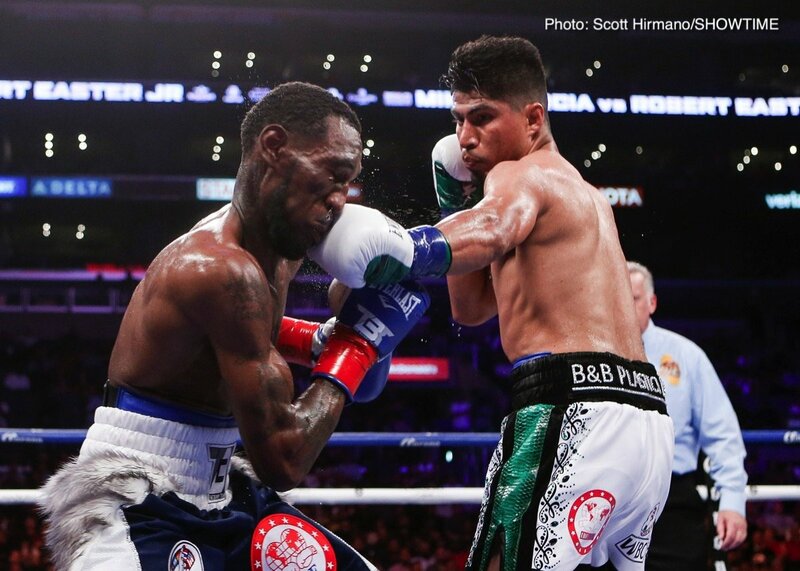 You are here: Home / Boxing News / RESULTS: Mikey Garcia beats Robert Easter Jr.